With Christmas fast approaching, and New Years Day nipping at its heels, I increasingly find myself thinking about the year that is drawing to a close, family, friends, and, of course, Route 66. After all that old highway seems to be the thread that ties it all together. Introducing friends and fellow fans of the road less traveled, including Route 66, from the Netherlands (Jeroen and Maggie Boersma) to some of the often overlooked gems in the Kingman area was a most delightful way to kick off the year 2014. Interestingly enough, the year 2015 will kick off with another visit with Jeroen and Maggie, and other Dutch friends but this time they will be showing us the sites in Amsterdam. A few weeks later we set out on another grand adventure in our very backyard. 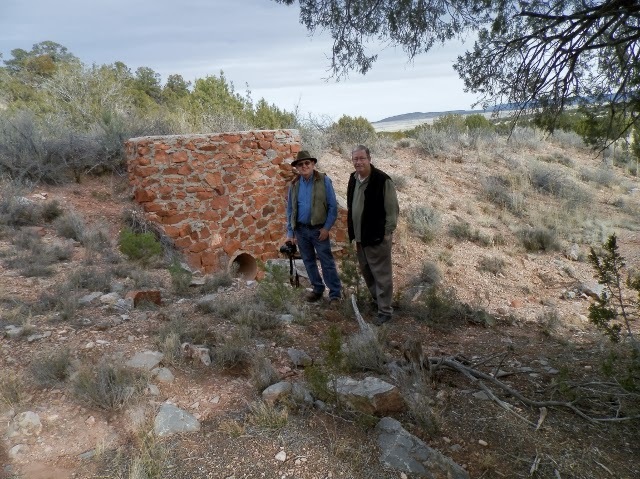 This time it was an exploration of the National Old Trails Highway west of Seligman on the edge of the Aubrey Valley with John McEnulty, owner of the Grand Canyon Caverns. 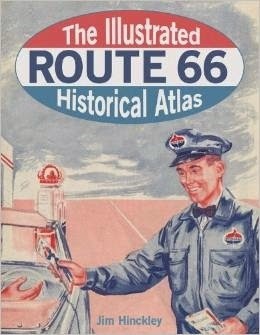 As Ian Bowman who works on Santa Monica Pier at 66 To Cali so eloquently put it, Route 66 is merely the gateway drug. Once you begin exploring the various manifestations of this iconic old highway, and its multifaceted culture and history, interest in other two lane highways, historic trails, and forgotten roads soon blossoms. As a result, there is a growing interest in the National Old Trails Highway, predecessor to Route 66 in the southwest and California. National Old Trails Highway in Arizona. Looming as silent memorials in the brush, the culverts and red stone retaining walls provided a palpable sense of history to our early morning winter hike. Our amicable host and guide, and the stimulating conversation that accompanied us on our journey through the scrub oak and cedar studded hills ensured it was a most enjoyable adventure. Plans for March, when possible, most always center on a business and cell phone free birthday adventure for my dearest friend. This year when I asked where she would like to go, my thoughts were on the coast as she loves to visit the ocean. Instead she surprised me with a request to see Crown King, and an adventure on the territorial era Senator Highway. So, that is exactly what we did. However, our plans for a bright and early start were a bit delayed resultant of interview with Rudy Maxa Travel World. 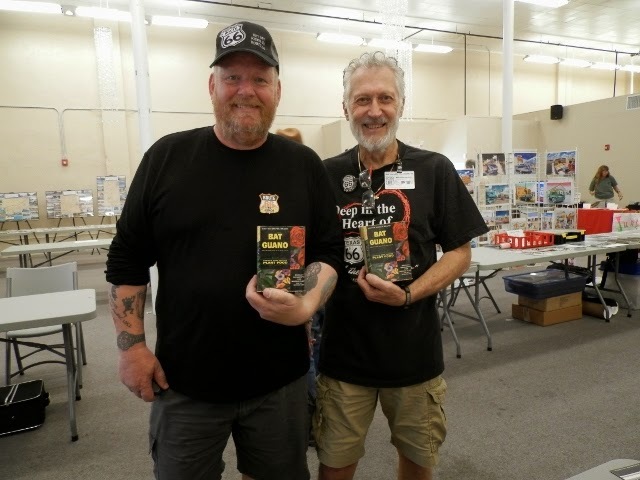 The latest book, Travel Route 66 was about to be released and Steve Roth was able to negotiate an array of top tier interviews resultant of the surge in interest in the double six. These included Frommer’s radio program, a Toronto newspaper, and print interviews for publications in New York, Chicago, LA, Oklahoma City, and Denver. To date, this has proven to be the most popular book yet written. That is either indicative of the popularity of the road or my growing fame as a writer and teller of tales. In either case it provided a real sense of satisfaction. After the interview we journeyed west on Route 66, bypassed Prescott on the new parkway, and commenced a journey through time at Mayer. As the desert winds stirred the dust from our tires, we motored through the fast fading remnants of Cordes Junction, and the old town of Cleator that hangs on to life with a very busy bar and general store, and then began the climb to Crown King along the narrow and twisted road that was once a railroad deemed an engineering marvel. on the dusty trail to Crown King. 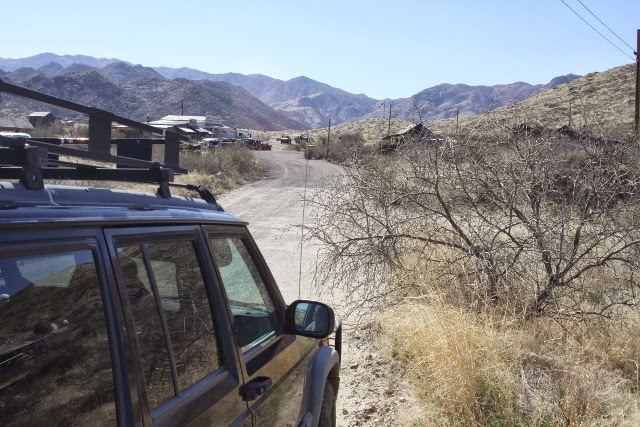 The faded mining boom town of Crown King just may be the busiest ghost town in Arizona, especially in the months of summer when off road enthusiasts in droves descend. Our home away form home for the evening was the delightful oasis that is the Cedar Roost Inn, a new favorite of ours, which was enhanced with a superb dinner at the Mill Restaurant. The latter is a recent incarnation with an ancient appearance resultant of ample usage of salvaged materials and a vintage stamp mill as the center piece. The following morning we headed home via the 1870’s toll road, the Senator Highway. What a grand adventure through the Arizona outback! Shade dappled rutted tracks that climbed high on to ridges where stunning vistas swept to the distant horizons, vestiges of boom towns and mining empires, and even authentic stage station are but a few of the highlights found on this most invigorating old road that is truly a link between the past and present. July proved to be a most interesting month. A an evening that began with Route 66 International Festival dinner meeting with Dora and Kurt Manley ended with us fording streets transformed into rivers. 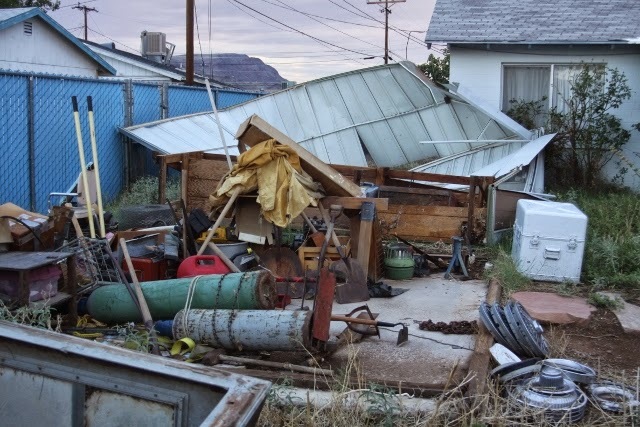 Incredibly, in the storm we also lost the workshop and shed at the homestead but there was no additional damage to the house or fence. Even though we did not embark on another Route 66 road trip until September, we still traveled around the world and never left home. We enjoyed delightful meals and wonderful visits with Dale and Kristi-Anne Butel, Dries and Marion Bessels, Wolfgang and Anja, George and Bonnie Game, Zdnek and his charming wife, Sam Murray, Hanneke Wiersma, the Kuperus brothers, Tim Kikkdert and his father, and Dr. Nick Gerlich and his family. We also met with tour groups and media tours from Australia and Canada, New Zealand and Holland, China and Germany, the Czech Republic and France. In May, for the first time in more years than I care to count, I was able to enjoy the Saturday festivities during the Route 66 Fun Run, including the kick off in Seligman and the cruise to Kingman, with my son. He sort of grew up with this event as it was our custom to attend every year if we weren’t on the road. As an added bonus, we got to share it with Sam Murray from New Zealand, the owner of Gilligan’s Wild West Tours who recently purchased the Frontier Restaurant and Motel in Truxton. In August we were privileged to attend the Route 66 International Festival and never left home. As always, it was a big family reunion filled with surprises and unexpected visitors. Many of our friends from Europe and Japan attended the gala as did the irrepressible Melba Rigg and her sister Renee Charles. Bob and Ramona Lehman, the Sondermans and Rich Dinkela, representatives from most of the state Route 66 associations, and a few from Europe, the Michael Wallis and Buz Waldmire, Scott Piotrowski and his delightful son, Gary Cron and Rick Zimmerman and his charming wife, Kaisa Barthuli and the Rice family, Bob Boze Bell and Jerry McClanahan, Jim Ross and Shelle Graham, the Wards and countless others ensured that the event was memorable, historic, and most exciting. For us a real highlight of the event was attendance by the legendary barber from Seligman, the one and only Angel Delgadillo, and a Saturday evening performance by Joe Loesch and the Road Crew. This would be the first of two opportunities to enjoy an evening with this delightful band. I would be quite remiss if it were not noted that a select few Route 66 enthusiasts were chosen for membership in a new and exclusive club. I will allow new members to explain if they so choose. 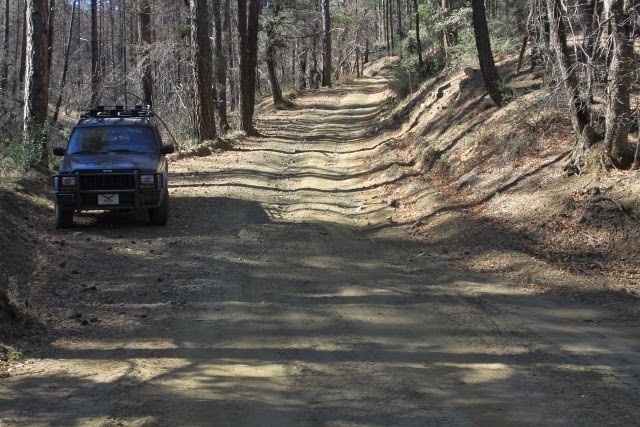 In September my dearest fried and I celebrated another anniversary, this time with a bit of back road adventure on the National Old Trails Highway with a weekend excursion to Winslow. 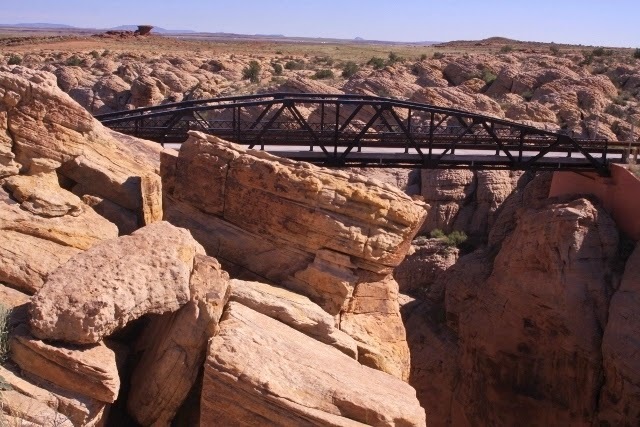 Our quest was to see the Chevelon Canyon Bridge that dates to 1913, which had been refurbished, before the taggers got to it. Then, in October, we set out for Cuba Fest via U.S. 54 through Kansas and Missouri where we were to kick off promotion for The Illustrated Route 66 Historic Atlas. Along the way we caught up with Dean Kennedy for dinner in Santa Rosa, and I introduced my dearest friend to a few roadside treasures such as the World’s Largest Hand Dug Well and Fort Scott, as well as the beauty of Lake of the Ozarks tinged with fall color. What really ensured our visit to the lake will never be forgotten was the generous hospitality of Bob and Robin at the Waters Edge Motel. The charming motel, a delightful dinner shared with our friends, and the soul stirring beauty of the lake at sunrise ensured this tirp would remain one of our favorites. Cuba Fest in Cuba, Missouri is a quintessential small town America event that is almost like stepping into a Norman Rockwell print. Still, as with Route 66 itself, what really makes the festival special as well as memorable are the people such as Jane Reed and Connie Echols, the proprietor at the Wagon Wheel Motel. As a bonus, it often becomes another opportunity for a Route 66 family reunion that includes a dinner with fellow “roadies” at Missouri Hick, a fireside party at the Wagon Wheel Motel, an evening with the Road Crew at Belmont Winery, and the pleasure of sharing table space with acclaimed authors, and friends, such as Joe Sonderman and Cheryl Eichar Jett. 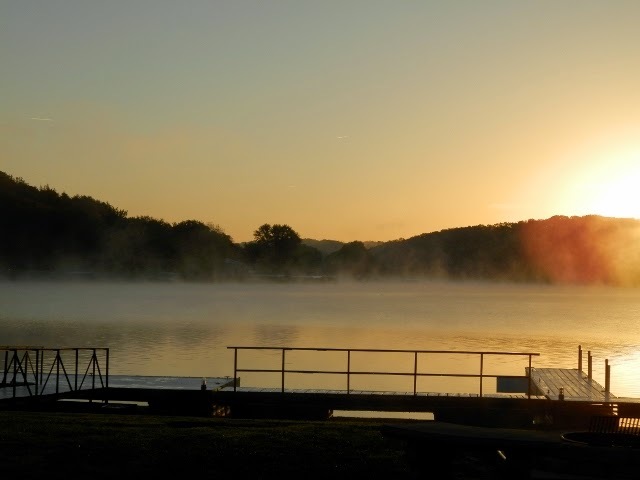 Sunrise over Lake of the Ozarks. After Cuba Fest, at an open house for Route 66 State Park, I spoke on Route 66 before heading toward home. The return trip was a bit of a harried affair but as it was a Route 66 adventure, there was time for friends along the way. There was a visit with Bob and Ramona at the Monger Moss Motel, dinner with Mike and Sharon Ward in Lebanon (and a breakfast in Albuquerque), a lunch with Texas Ivy at the Golden Light in Amarillo and a visit with Vickie Ashcraft at the Enchanted Trails Trading Post and RV park in Albuquerque as well as a couple of book signings. On the heels of this adventure followed a book signing at Auto Books – Aero Books in Burbank, and at the Autry National Center. Anna, the intrepid young lady from the Ukraine on an around the world adventure that we had met at the Route 66 International Festival stopped by the signing in Burbank, as did Jay Leno, John and Judy Springs, Scott Piotrowski, Ester Brym, and a number of folks with an interest in Route 66. To say the very least, it was a most fascinating day. 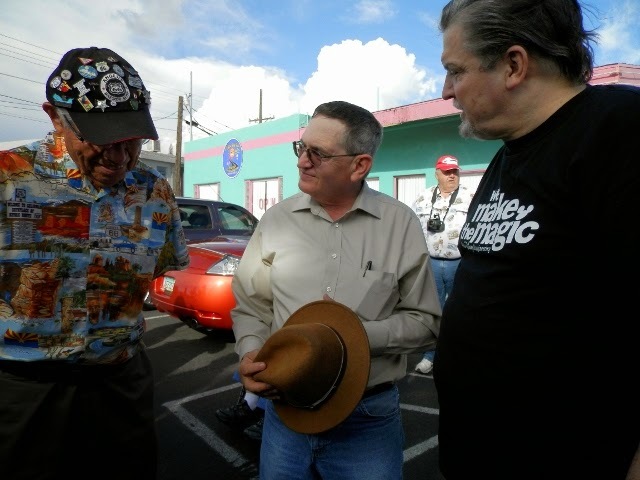 Before heading home on Sunday afternoon we embarked on a long overdue Scott Piotrowski led tour along the many fascinating facets of Route 66 in the greater Los Angeles metropolitan area. The tour confirmed my suspicion that remote sections of the old double six in the deserts of Arizona and California may be better known than these urban alignments. It also left me with eager anticipation for 2016. That is the target date for Mr. Piotrowski to introduce the world to the wonders at the original western terminus of the highway with a gala 90th anniversary celebration. Before bidding adios to the metropolis, we made a short stop at the Wigwam Motel in Rialto to sign books, and to visit with Kumar. For the Route 66 novice or well seasoned traveler, a stop at the Wigwam Motel and a visit with colorful Kumar is an absolute guarantee that the trip will truly be memorable. Less than a week later, I drove to Albuquerque and attended the steering committee facilitated by the World Monuments Fund and the National Park Service Route 66 Corridor Preservation Program. This is a story in itself but suffice to say, I am rather confident that we may be on the cusp of seeing the rebirth of the modern equivalent of the U.S. Highway 66 Association. Tonight we wrap up a very full year on Route 66 with dinner shared with Nancy Barlow and KC Keefer. Our adventures on the double six in 2014 commenced with friends, and so it is rather fitting that we are closing it out with friends. The final days of the year will be shared with family, and consumed with a mad dash to complete a book that I seem to have fallen behind on, and the laying of plans for another year of adventures tied to legendary Route 66. In closing this out, I would like to thank everyone who made this a most enjoyable and exciting year. Thank you. If you weren’t mentioned in today’s post, please don’t think you were forgotten. Now, it is our sincere hope that you are blessed with a delightful Christmas holiday, and that the new year is filled with laughter, health, and boundless adventure.